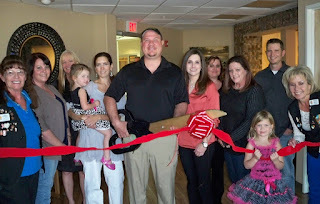 The Lake Havasu Area Chamber Ambassadors held a ribbon cutting ceremony for Panacea Brain and Spine LLC celebrating its new membership with the chamber. Attending the ribbon cutting from left to right were Linda Sugamele, Jennifer Estrada, Debi Ade, Ellie Hartley, Tracey Hartley, Chad Hartley, M.D., Janet Igoa, PA-C, Lindsey Speer, Meg Zdrojkowski, Emma Hartley, Sean Pughes, and Kathy Baumer. Dr. Hartley opened his neurosurgery office, Panacea Brain and Spine Healing and Wellness Center in November, 2012 after relocating from Colorado. He specializes in comprehensive brain and spine care, both surgical and non-surgical techniques including minimally invasive spine surgery, stem cell surgery and artificial discs. His goal is to eliminate pain in a healthy way by using alternative medicine therapy. For more information contact the office at 928-453-2211.